“We urge your government to take immediate steps to ensure the fundamental rights of religious minorities are protected and the perpetrators of violence are held to account,” the leaders wrote. “Of particular concern is the treatment of India's Christian, Muslim and Sikh communities. On June 17, 2014, more than 50 village councils in the Bastar district of Chhattisgarh adopted a resolution banning 'all non-Hindu religious propaganda, prayers and speeches' in their communities,” they stated. 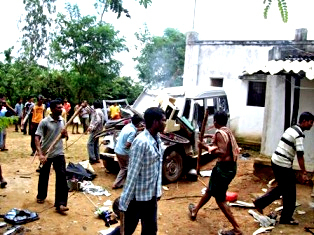 The ban thus “effectively has criminalised” the practice of Christianity by around 300 families in the region a day after a mob, including members of the Vishwa Hindu Parishad and the Bajrang Dal, attacked and injured six Christians at the village of Sireiguda. “Since the ban was implemented, Christians in the Bastar district reportedly have been subjected to physical assaults, denial of government services, extortion, threats of forced expulsion, denial of access to food and water, and pressure to convert to Hinduism,” they allege. Stating that they were also concerned about the “nearly country-wide beef ban,” the lawmakers referred to the killing of Mohammad Hasmat Ali in Manipur in November for stealing a cow and the murder of Mohammad Saif in Uttar Pradesh in September. The letter also called for recognition of Sikhism as a distinct religion as not doing so prevented practitioners of the religion “from accessing social services and employment and educational preferences available to other religious communities”. “Mr Prime Minister, we applaud India as a pluralistic society with a long-standing commitment to inclusion and tolerance,” they assured Prime Minister Narendra Modi. “We also applaud your statements about religious freedom and communal harmony, including your promise in February 2014 that your government would 'ensure that there is complete freedom of faith ... and not allow any religious group, belonging to the majority or minority, to incite hatred against others.' We urge you to turn these words into action by publicly condemning the ban on non-Hindu faiths in Bastar district of Chhattisgarh, and the violent assaults and other forms of harassment against religious minorities throughout India,” it stated, adding that steps should be taken against activities of groups such as the RSS. The letter was signed by Senators Roy Blunt, Amy Klobuchar, James Alankford, Al Franken, Tim Scott, Ben Sasse, John Boozman and Steve Daines and 26 members of the House of Representatives, including Joseph R. Pitts, Keith Ellison, Brad Wenstrup, Jim Costa, Trent Franks, Ted Poe and Mark Walker. March 2, 2016 (Tirunelveli, Tamil Nadu, India): Pentecostal Church affiliates in India have protested against “steadily increasing attacks on Christians,” and asked the government to intervene and shield them from violence. The Tirunelveli District Pentecostal Churches Federation in the southern Indian state of Tamil Nadu said they were being attacked by Hindu fundamentalists who want them to stop preaching Christianity, even though the country mandates freedom of religion. The attacks have led them to question their belief that they lived in a democratic and tolerant country. “Though we’re being targeted, we’ve never retaliated and done anything that would undermine the tranquility of society as Christianity is all about love, compassion and brotherhood,” Pastor Babu Paul Dinakaran, district secretary of the federation, told Bibles for Mideast. He also asserted that they practice their faith without encroaching on others’ religious rights. “However, heads of a few Hindutva outfits are encouraging their cadres to orchestrate attacks against us,” he added. They noted that even those distributing the pamphlets and praying in the prayer halls were being attacked. The federation urged the government to take lawful action against the perpetrators, and take down billboards that carry inflammatory messages against religions. The Catholic Secular Forum in India released a report identifying Tamil Nadu among the top five states with the highest numbers of anti-Christian attacks, with the state of Madhya Pradesh leading the list.